Adult – Weight control. All breeds. Vetdiet® adult weight control all breeds dog food is specially formulated for dogs prone to weight gain. 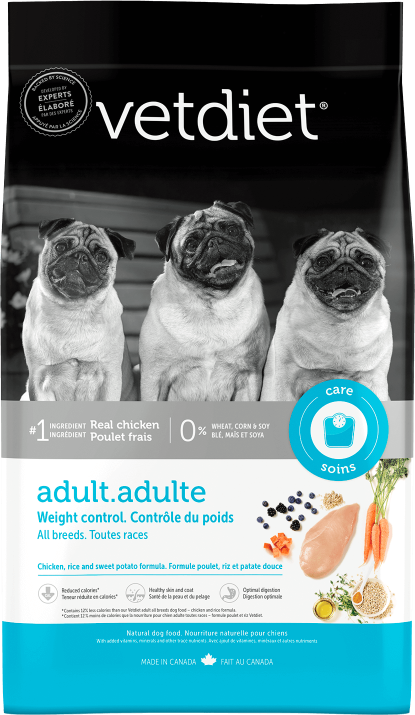 This dry food for dogs that have a tendancy to develop excess weight is made from deboned chicken, whole grains and other natural ingredients. Our formula is designed to deliver fewer calories with a blend of natural fiber, optimal levels of protein and L-carnitine, which will help your dog attain and maintain a healthy weight. Contains 12% fewer calories than our Vetdiet® all breeds adult dog food – chicken and rice formula. High-quality protein from deboned chicken as well as added natural fiber from ingredients such as peas and whole barley contributes to a feeling of fullness and help achieve a healthy weight. Deboned chicken, chicken meal, brown rice, dehulled barley, oat groats, whole oats, whole barley, peas, flaxseed, sun-cured alfalfa meal, sweet potatoes, dried tomato pomace, chicken fat (preserved with mixed tocopherols and citric acid), yeast culture, natural chicken flavor, salt, fish oil, potassium chloride, choline chloride, vitamin E supplement, yeast extract, DL-methionine, L-lysine, taurine, chicory root extract, L-carnitine, Yucca schidigera extract, fumaric acid, lactic acid, citric acid, malic acid, dried kelp, peppermint leaves, dried spinach, dried carrots, chia seed, dried pomegranate, dried blueberries, dried cranberries, dried apples, dried blackberries, dried broccoli, quinoa, dried pumpkin, dried avocado, dried kale, green tea extract, dried parsley, rosemary extract, thyme extract, carob bean, paprika, ginger, chamomile, turmeric, aloe vera gel concentrate, ferrous sulfate, zinc oxide, zinc proteinate, selenium yeast, ascorbic acid (vitamin C), iron proteinate, manganous oxide, niacin, calcium pantothenate, manganese proteinate, vitamin A acetate, copper sulfate, riboflavin, vitamin B12 supplement, pyridoxine hydrochloride, thiamine mononitrate, biotin, potassium iodate, copper proteinate, vitamin D3 supplement, folic acid. Calorie content (ME Calculated): 3,180 kcal/kg or 363 kcal/cup. Vetdiet® adult weight control all breeds dog food is formulated to meet the nutritional levels established by the AAFCO Dog Food Nutrient Profiles for the maintenance of adult dogs. It is important to feed your pet the daily ration that corresponds to the ideal body weight recommended by your veterinarian.\n\nAs your dog is unique, optimal food quantities may vary according to its age, size and activity level. Start by giving it the recommended ration and adjust\nthe quantity based on its needs. Make sure your dog always has plenty of fresh water. The switch needs to be gradual. Start the transition by feeding your pet a mixture containing 75% of the old food and 25% Vetdiet®. Then, over 7 to 10 days increase the relative proportion of Vetdiet® pet food until the transition is complete.